Here are the details that they sent to us. Our game has been designed with a single objective in mind – to allow us to play fast paced and exciting miniature battles upon a modestly-sized table between rival forces of that we describe as warbands. A warband represents your own band of warriors – courageous humans, blood-thirsty monsters, perhaps even minions that you have raised from beyond the grave to do your bidding. We saw a lot of announcements over the course of GEN CON and have curated a few of the ones we’re most excited about here for you. Every Archon Deck contains a full play experience with a deck that cannot be altered, meaning it’s ready to play right out of the box. Not only does this remove the need for deckbuilding or boosters, it also creates a new form of gameplay with innovative mechanics that challenges you to use every card in your deck to find the strongest and most cunning combinations. It is not the cards themselves that are powerful, but rather the interactions between them—interactions that can only be found in your deck. Your ability to make tough tactical decisions will determine your success as you and your opponent trade blows in clashes that can shift in an instant! We’re so excited for this game that we are already taking pre-orders for both the Starter Set and additional decks at Sentry Box. Contact the store today to reserve your copy. It is expected to arrive on shelves in the fourth quarter of this year. This past week the Spiel de Jahres 2018 winners were announced. Taking top prize of Game of the Year was Azul by designer Michael Kiesling. A huge congrats to this designer for making one of the most buzzed about games this past year. Come down to Sentry Box to get your own copy of this fantastic game by publisher Next Move. Winning the Connoisseur-gamer Game of the Year (given to heavier games) was Die Quacksalber von Quedlinburg by designer Wolfgang Warsch, who was responsible for 2 of the 3 nominees in the category this year. Currently only available in the European market, North Star Games has announced that it will be bringing this game to the North American market by the end of this year. Another week of newsletters has been shifted through so that you don’t have to. 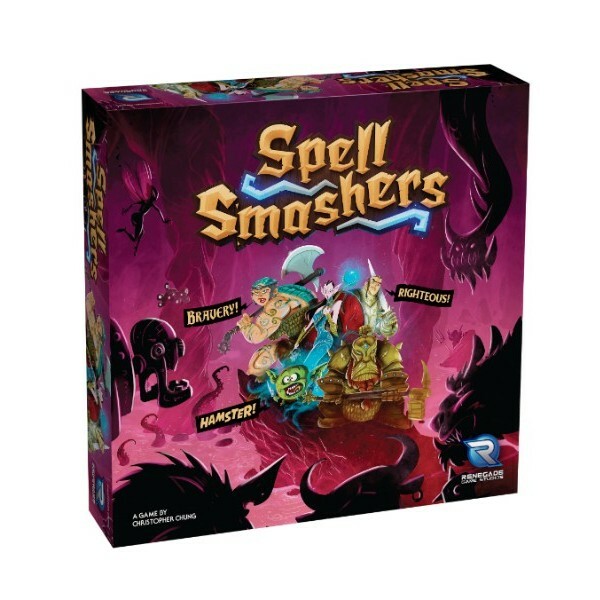 Renegade Game Studios™ is excited to announce a new word- and sword-slinging game — Spell Smashers! This title is designed by Christopher Chung, designer of award-winning Lanterns: The Harvest Festival. It also boasts a notable artist, The Mico, renown for his work on the North Sea Trilogy. The two combined create a product bursting with dynamic visuals and engaging gameplay. In Spell Smashers, you combine your letter cards to spell words, smashing fearsome monsters and their even more fearsome adjectives! You can find this title on game shelves beginning in October 2018. Stampede has come and gone for another year but that doesn’t mean that you can’t keep the yahooing going for the rest of the summer. There are some fantastic western and cowboy themed games that don’t require you to limit your love of all things wild west to one week a year. Pioneer Days is a newer release that we played on our livestream last month. In this game you collect goods in your wagons, mine for gold nuggets, raise cattle, recruit townsfolk and work to gain the favours of the towns you travel through to collect points. Played over 4 weeks, at the beginning of each week, you roll a set of dice that you will take turns drafting to trigger various actions over 5 days (turns). At the end of the day, the leftover die goes on the matching coloured disaster track. When a disaster triggers you have to be prepared with the proper goods or you risk losing your cattle, townsfolk or damaging your wagon. It’s summertime and for many of us that means vacations. Whether you’re looking to play games around the campfire, while waiting for a connection at the airport, or with friends or family at your destination, we here at Sentry Box have you covered. Age of Sigmar: Soul Wars is coming and The Sentry Box is now taking preorders for the boxed set, General’s handbook, Malign Sorcery boxed set and all the other items that will be released for the new version of Age of Sigmar on June 30th. Come down to the store, or call and put in your pre-order now with no cash down. Earn double Vicinity points on all pre-orders. Don’t have a Vicinity account? Then set one up for free when you place your pre-order. After a two week vacation we are back bringing you the news stories from the Table Top and Board Gaming world that we found interesting. Zac and some of the other miniature gaming lunatics are thinking of starting up a Beyond the Gates of Antares slow grow league. Anyone interested? We’ll be taking orders for starter sets and other add-ons in the next week if anyone wants to get in on the fun.